Dr. Jeanene Reese is associate professor emerita of Bible and director of ACU's Center for Women in Christian Service. 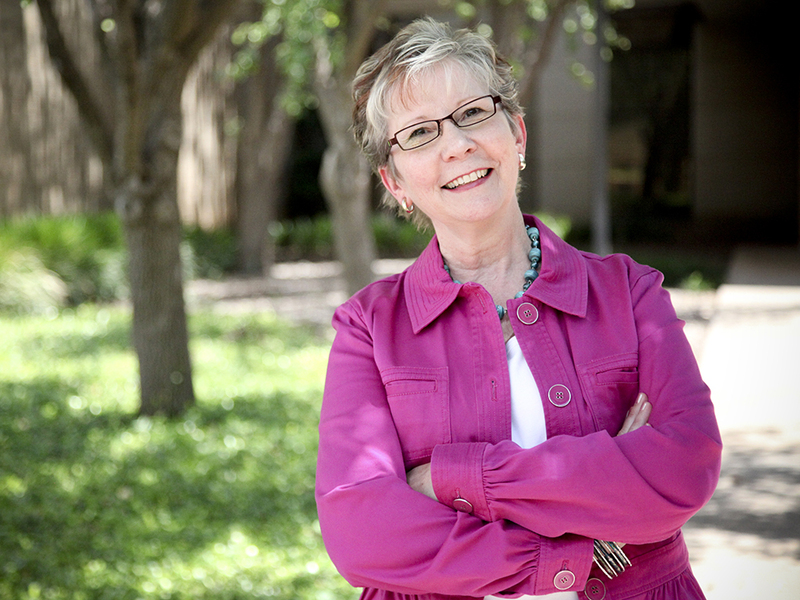 Whether counseling students in her office, leading ACU’s Center for Women in Christian Service, or uplifting women missionaries and Christian leaders around the world, Dr. Jeanene Reese (’74) is answering God’s beckoning. “My call is to be a faithful woman serving in the opportunities God has given me,” she said. And those opportunities are many. Reese not only has taught at ACU for the past 20-plus years but also served the department as associate chair (2011-18) leading a major curriculum revision at that time. Now retired, she continues to teach as an adjunct in the department. Reese was one of the founding members of the Community of Women Ministers in Churches of Christ and directed two of the many seminars held to encourage this group of female leaders and ministers across the U.S. Her service opportunities, however, stretch around the world. She has been a member of the leadership for the women’s missionary organization, Come Before Winter, since its beginning in 2001. The organization takes its name from the Apostle Paul’s plea to his friend, Timothy (2 Timothy 4:21), when Paul was in prison and in need of encouragement from friends. Reese and others involved with the ministry conduct renewals for missionary women worldwide. She serves as a chief equipper and curriculum writer for the organization. Back at home, Reese provides mentoring and spiritual counseling to students and helps equip them for future work in churches or other service organizations. In her book, Bound and Determined: Christian Men and Women in Partnership (Leafwood Press, 2010), Reese expounds on an eight-year study she did among her students training them to work more effectively together. One of her sermons is included in D’Esta Love’s book, Finding Their Voices: Sermons by Women in the Churches of Christ (Leafwood Press, 2015). Reese also conducts retreats and seminars, as well as teaching courses at international colleges and universities. Her efforts have been recognized in various ways. She was Outstanding Faculty of the Year for the College of Biblical Studies in 2004 and was ACU’s University 100 Teacher of the Year in 2003. She twice was recognized with Pepperdine University’s Distinguished Christian Service Award, in 1997 and 2008.